A protest outside an embassy in Washington on Thursday highlighted how far the Chinese regime can go in suppressing free speech. 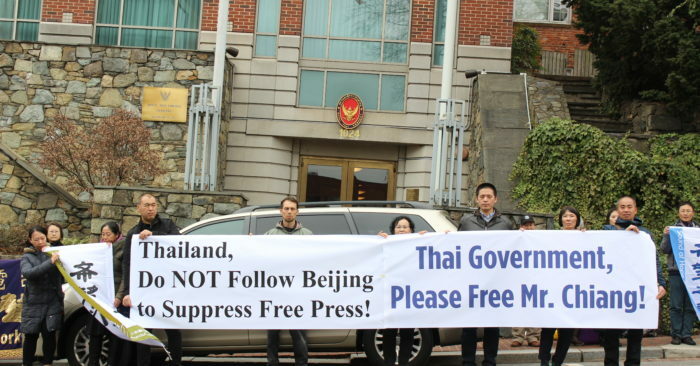 The protest did not take place at the Chinese Embassy, but instead at the embassy of the Kingdom of Thailand. The Sound of Hope (SOH) radio network held a press conference and rally to protest the detention of Chiang Yung-Shin, a Taiwanese national who helped SOH by leasing a house in Thailand to set up its shortwave radio broadcasting into China. Thai police raided the shortwave site in August 2018 and arrested Mr. Chiang on Nov. 23, 2018. Both actions, Thai police said, were taken at the request of the Chinese regime. SOH is a U.S.-based Chinese-language radio network that broadcasts uncensored news and information that Chinese authorities would rather Chinese people not listen to. A letter from SOH President Allen Zeng that was delivered to the embassy on Thursday said, “We broadcast general news to China, including news about human rights violations against religious groups, minorities and under-privileged people. We also broadcast news about environmental crisis, epidemics, and government brutality against people. The letter was delivered by SOH Spokesperson Frank Lee and accepted by a Thai embassy staffperson who declined to give his name or title. A statement by SOH said that the Thai government alleges that Mr. Chiang violated its communications business law, with a possible 5-year maximum prison sentence. Chiang is currently free on bail in Thailand, but is forbidden to return to Taiwan. He is set to face a court on Feb. 12 in the northern Thai city of Chiang Mai. Chiang was an executive for a Taiwanese company in Thailand. He talked about freedom of expression, and the importance of enabling Chinese people to know what is happening in their own country.